FIRST TEAM MENSarrow-rightCreated with Sketch. A strong second half showing was enough for Port Melbourne to get over the line tonight with a 2-0 victory giving the home side a 100 per cent record to start the season. After being on the back foot for most of the first half, goals to Kamal Ibrahim and Ryan Opperman sealed the points for Eric Vassiliadis’ side. Pascoe Vale, fresh from its 3-0 loss to Heidelberg last week, came out strongly against the fancied Port Melbourne side. Regularly pressing high up the park, the visitors appeared to have a renewed confidence, with Michael Ferrante a welcome inclusion into the starting 11. Port Melbourne was keen to absorb the pressure throughout the first half, and had Stjepan Gal to thank on numerous occasions as the shot stopper made some crucial saves early on from Nakic brothers, Adam and Jake. As half time drew closer, Ferrante had a great opportunity for the visitors when his free kick was plucked out of the top corner by Gal. The second half however began with a bang when Kamal Ibrahim drifted inside and hit an absolute rocket into the top corner leaving Stefaan Sardelic with no chance in the Pascoe Vale goal. Pascoe Vale was furious as the side argued that James Riccobene had committed a foul just prior to the goal, but the referee awarded it regardless. Pascoe Vale captain Joseph Youseff almost pulled the visitors level when his turn and strike just sailed wide of the post after 63 minutes. However it was not to be for the visitors when new signing Ryan Oppermann sealed the points for the home side, with his header finding its way into the back of the net. 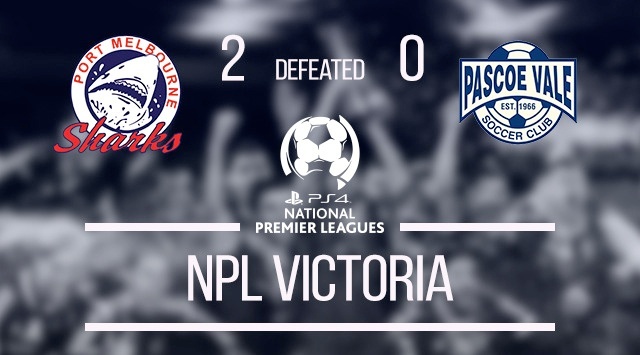 Pascoe Vale threw on Tom Black and Adrian Talarico in response but the hosts held on to secure another valuable three points, leaving Pascoe Vale still searching for their first points of the 2015 NPL Season.